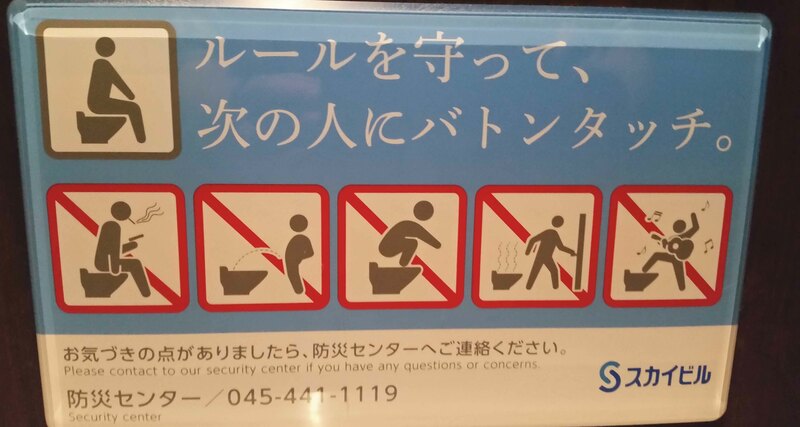 Here’s a little quirky photo for you of a sign in a toilet in Yokohama, Japan. Some very important things you are not to do in the toilet. The amusing ones are the last two. I presume that the second last one is ‘don’t forget to flush’, but when I first saw it I naturally thought ‘don’t dispose of nuclear waste in the lavatory’ as the most likely explanation. The last one is the best though. It’s sad I can no longer bring my electric guitar into the loo and rock on hard. Which less face it, is what most people want to do in the loo! So funny – I’ve seen some others like this but never the one with a guitar! This photo is so funny! I am literally laughing out loud!